It’s a little embarrassing that I’ve got a blanket wrapped around my Christmas tree stand, Linus style. Thing is, the tree skirt my mom made didn’t survive the wash. It was smelly when I took it out of the ornament box so I tossed it in the wash. I knew it might fall apart because of the materials she chose to use at that stage of her quilting journey. Plus the ties weren’t close enough together. Mom’s later quilts were better but this skirt is beloved and has been used under my tree for years. Well, it got all lumpy in the wash.
All is not lost. 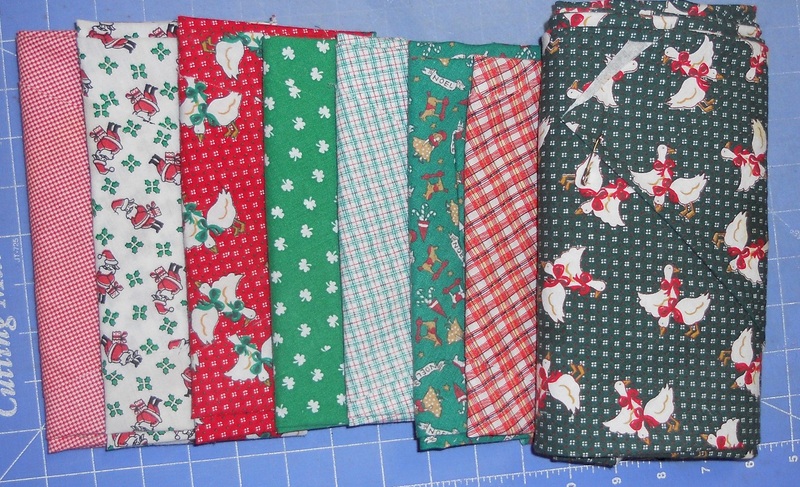 I’m redoing my childhood reading quilt and I can do something similar with the fabrics from this tree skirt. 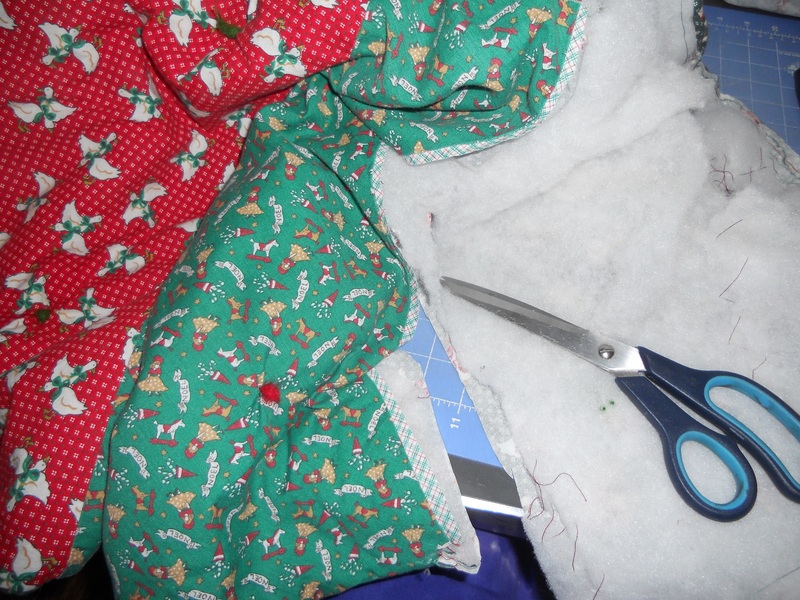 So I cut it apart and set the fabrics aside to repurpose into a couch throw later. They’re a little threadbare but with the right interfacing it won’t be a problem. For now they’re in a UFO box next to the reading blocks. Will you please help? The turtles quilt still needs more pieced tree blocks for the final border. Click here for more information and here for the tutorial. This entry was posted in Challenges, Family, UFOs, Uncategorized and tagged blanket, Christmas, Christmas fabrics, Christmas tree skirt, cut it up, Family, family heirloom, Heirloom, Linus, lumpy, mistakes, mom, new life, new quilter, quilter, repurpose, repurposed fabric, skirt, threadbare, tied not quilted, tree skirt, UFO, washing quilts on December 9, 2015 by quiltartbymegan. Welcome to day one of the 31 days blog challenge. This challenge is Cheryl Sleboda’s idea and I’m glad to be a part of it. I’ll be blogging every day from now until the end of this year. Yesterday was Cyber Monday, which wrapped up the Thanksgiving holiday weekend shopping specials. The 30% off moving sale is still happening in my etsy shop. You know, ’cause I’m still moving and want to have less stuff to shlep. Anyway, I highlighted a few of my favorite small businesses this weekend on the quiltartbymegan Facebook page. Here they are in one spot. Check ’em out! Alex Cook is the artist behind the Multi Mural Project. Community art at its finest, messages like “You Are Loved” are painted on places like school walls, city streets, and inside prisons. It’s led and organized by Alex and the community come in and help paint within his outline with colors he’s chosen. Here’s Alex’s website which includes the murals as well as his musical and written art. Fed By Threads is a clothing store (in Tucson and online) with American-made organic clothing. It’s body-positive and built to pay everyone from designers to sewists living wages. This is in stark contrast to most clothing companies which use sweatshops overseas to manufacture most of their products. Facebook ’em here and check out their website and shop here. Katwise makes whimsical coats out of old wool sweaters. Watch her Facebook page for announcements on when the next sale will be. You’ll want to be waiting at her etsy shop when it goes live because they sell out in minutes. No kidding. She also has patterns if you want to try your hand at it. I’ve made a bunch of arm-warmers from her tutorial. Gregory Patrick of Mad Man Knitting is a blogger, author, and pattern designer. He knit teddy bears and worked his way out of homelessness with this small business. His story is inspiring and his stuff is super-cute. Here’s his website and Facebook page. X-bility has experiential learning courses that have enhanced how I view myself, my relationships, and the world around me. They’re well worth flying into St. Louis for. Check out their website and Facebook page. Carol Carter is a watercolor painter. Check out her website here: and find her on Facebook here. She’s great at posting photos of her paintings on Facebook so you’ll want to follow her page. Carol does commissions as well as buy-now paintings. She also teaches. This entry was posted in Challenges, Collaborations, Inspiration, Tips and tagged 31dayblogchallenge, Alex Cook, American-made, artist, blog challenge, Carol Carter, community art, favorite businesses, Fed by Threads, Gregory Patrick, I recommend, Katwise, knitting, Mad Man Knitting, Multi Mural Project, painter, painting, Phoenix2000, recommendations, repurpose, responsible buying, sale, small business, sold out, teddy bear, upcycle sweaters, watercolor, well paid, whimsical, Will Knit for Food, wool jackets, writer, X-bility on December 1, 2015 by quiltartbymegan.